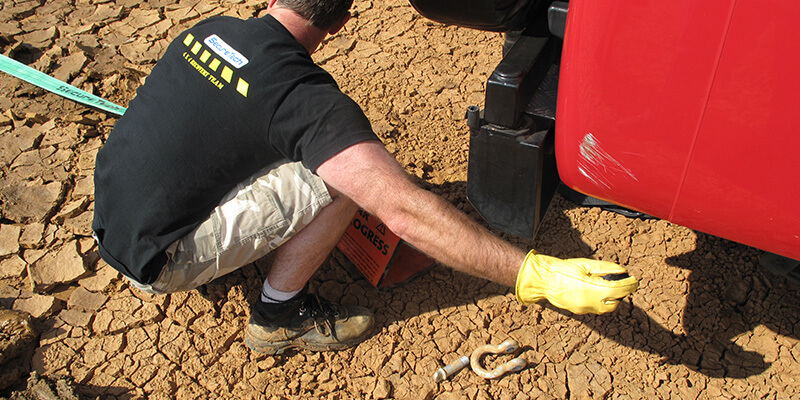 Shackles are used every day in a various applications such as securing loads, rigging and vehicle recovery. However as with all safety critical items of equipment there are a few points that should be considered and adhered to. Attach multiple sling eyes to the bow, not the pin. Attaching leyes to the pin can damage or weaken the sling. When connecting shackle to shackle, connect bow to bow or bow to pin. Never connect pin to pin. Alloy rated bow shackles can be side loaded, do not side load “D” shaped shackles such as D shackles, chain shackles or long reach shackles. These shackles are designed and rated for straight in-line tension and we do not advocate their use for recovery. When using a shackle in combination with any form of wire rope, the shackle size selected must be equal to or larger than the wire rope diameter. If using a shackle with synthetic slings such as a lanyard or bridle, ensure the shackle is big enough to avoid pinching or damaging the sling material. Shackles should not be subjected to high or low temperatures that could adversely affect the strength of the shackle. Always ensure shackle pins are properly engaged. Screw pin shackles need to have threads fully engaged on the shackle ear. (The pin should be flush with the outside of the shackle body and thepinhead should make contact with the shackle body. Bolt nut and cotter shackles need to have the bolt and nut properly secured with the cotter pin attached. Due to the dynamics of a recovery exercise it is advisable to loosen the tightened pin by a half turn to facilitate easy removal once the recovery is completed. Use bolt nut cotter anchor style shackles, if shackles will remain in place as a semi-permanent application or if they will be suspending a load. Screw pin shackles are used when the shackles are removed after the exercise is completed. If a screw pin shackle is being used to suspend the load for any length of time, it is advisable that you tie off the pin to the body of the shackle with wire.